While on my way to a NY Islanders game a few months back, the bus I was riding passed by Belmont Park. 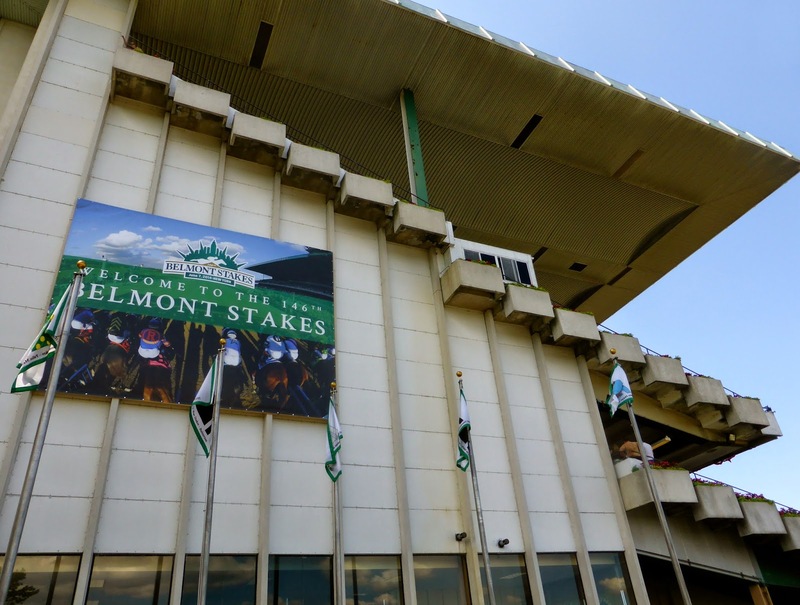 I did not realize that this famous racetrack was in New York City (well, technically it is in Elmont, just across the border from Queens) and so I immediately made plans to visit the Belmont Stakes, the third leg of horse racing's Triple Crown. Normally the race is a relatively minor event compared to the other two legs, but this year, California Chrome came in with a chance at the Triple Crown and excitement was in the air. I took the bus again, only to have it come to a standstill about a mile away from the racetrack due to traffic. It was quicker to hop off and join the colourful contingent making their way along Hempstead Avenue. Like the Derby, fans dress up with pastels the choice for both men and women, while fancy hats were also quite common. I had applied for a media credential through Stadium Journey and received an email the night before indicating where to pick it up, but it turns out I wasn't approved after all. Given the disorganization that the NYRA demonstrated with the entire media application, this wasn't surprising. With admission just $10 for the grandstand, there was no problem getting in, but I was limited to that area. There are three floors in the grandstand, each with dozens of betting windows, concessions selling overpriced food and beer, and 33,000 seats, all reserved for ticket holders. Attendance was announced at 102,199 but it seemed like a lot more as there was no room at all anywhere, with long lines at food stalls, restrooms, and the betting windows. 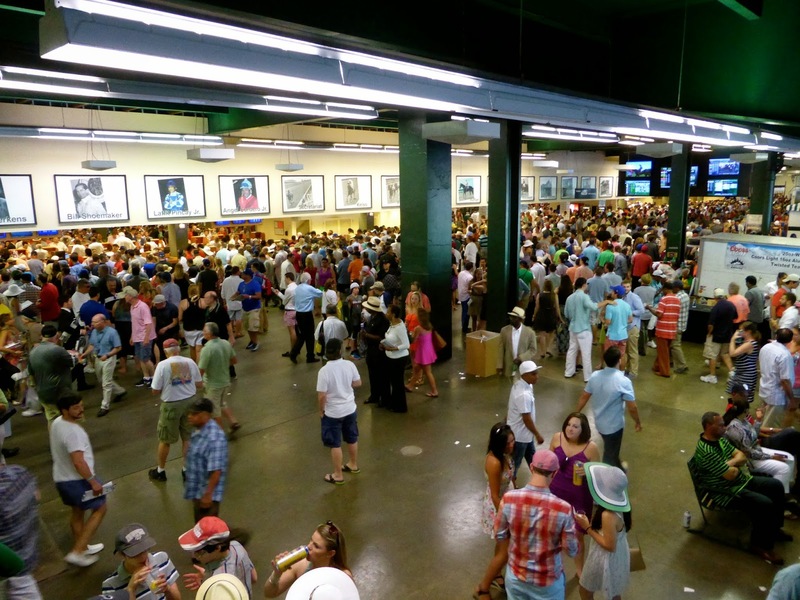 Below is a shot of the interior of the grandstand, still hours before the big race; by 6 pm it was even more crowded. The clubhouse is located on the east side of the track and admission here was $30. 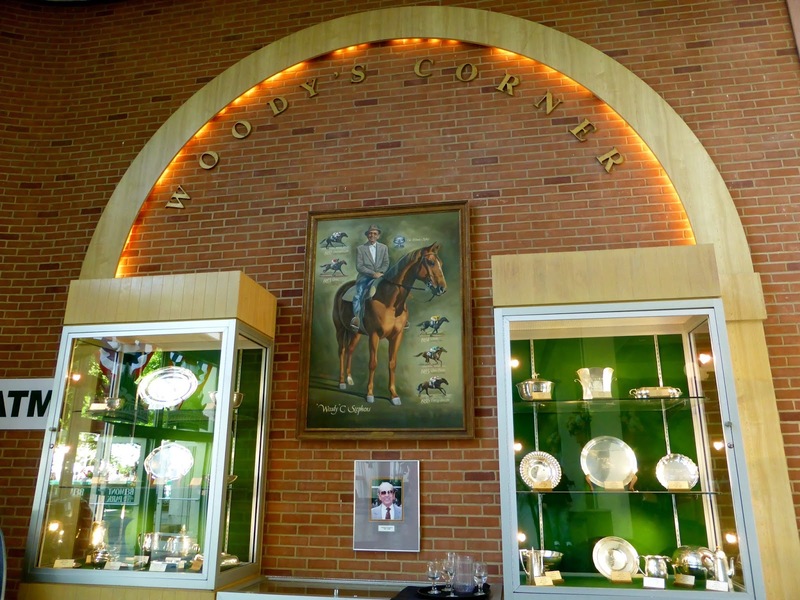 There didn't seem to be any additional benefit to getting in here, but there was a small commemorative display for Woody Stephens, who trained five consecutive Belmont Stakes winners between 1982 and 1986. Post time was 11:35, but I didn't arrive until after 2, and by the time I got myself sorted, the 7th race was about to begin. I wandered down to the finish line to watch that, and probably should have stayed there. But with the time between races 45 minutes or longer, standing in the heat with the crowds was not a pleasant option, so I took a tour. The paddock is where the horses are paraded before moving to the track. 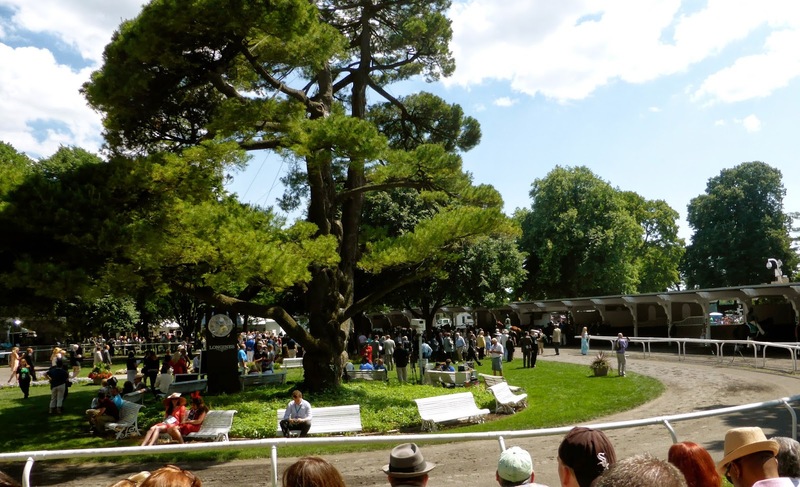 This allows knowledgeable bettors to get a close up look at the thoroughbreds to see if there is anything that might affect them during the race. I stopped by briefly but it wasn't that exciting. I made my way to the upper tier and sat there for the 8th race. The weather was perfect as you can see below but with all seats reserved, I knew I wouldn't be able to stay here for long. My friend Andrew was visiting from Philadelphia (a 2-hour drive took 4 due to the traffic) and we met up and walked around some more. 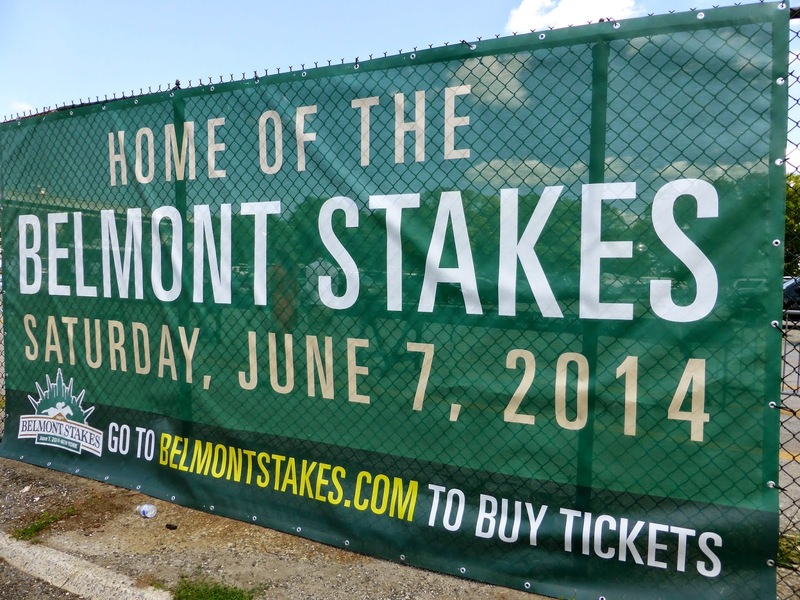 By the time the 10th race had finished, most of the crowd had taken their spots for the Belmont Stakes. I moved down to the first floor near the finish line, but with at least 10 people in front of me, there was little to see and no point in even trying to take a picture. I watched the race on the large TV on the track and as it became clear that California Chrome would not take the Triple Crown, the crowd immediately deflated. Tonalist won out of the 11 gate while California Chrome finished in a dead heat for fourth. Although there were two more races on the card, most fans started leaving right away. "Let's Go Rangers! "chants were heard among the departing, but on this night, California got a measure of revenge on New York as the Kings won in 2OT (and the Giants beat the Mets too). 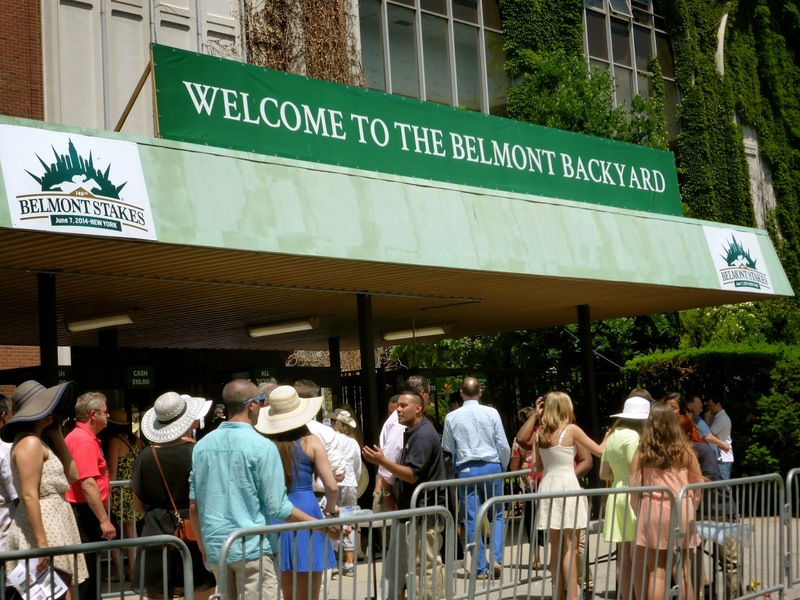 I plan to go to the Belmont again next year, but this time I'll buy tickets in advance, seats can be had for as low as $20. 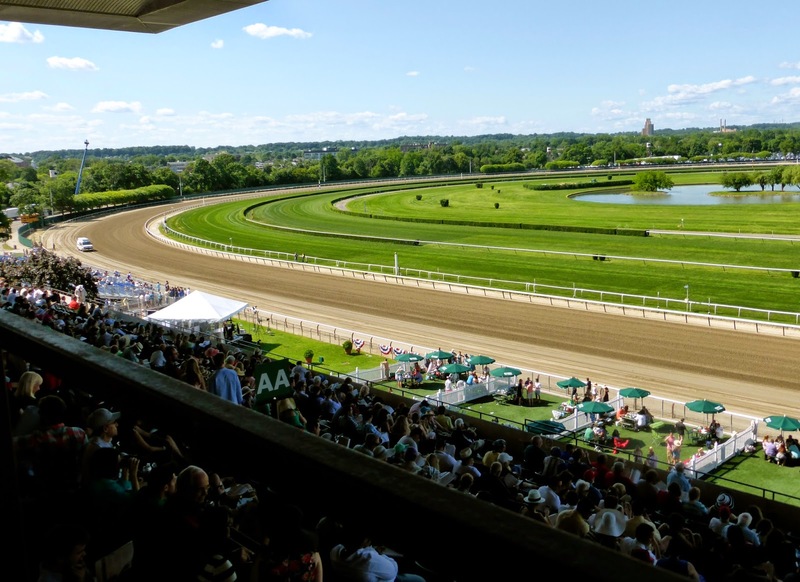 If you want to visit New York, early June is a good time to do so and you can add one of horse racing's biggest events to your sporting resume. As interesting as the ponies are, I'm gearing up for some interesting football this summer. And guess what, my pal Sean? I'm going to be in New York. Whatsapp or text me your mobile number. June 18-20 and then July 11-15. Let's plan to watch the Final somewhere cool.